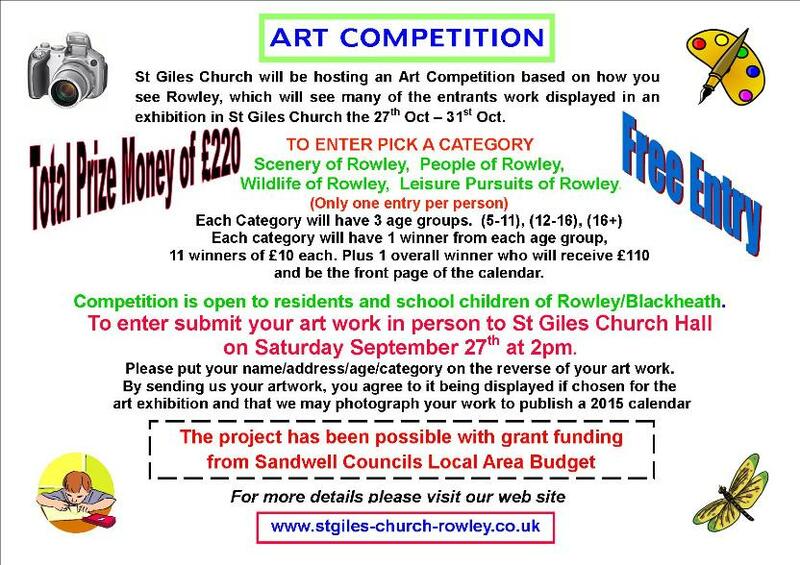 St Giles church will be hosting an art competition based on how the community see Rowley. Many of the entrants work will be displayed in an exhibition in St Giles church the 27th -31st October 2014. The community gave so generously for the talent show; that St Giles church will be giving a total of £220 prize money for the art competition. There will be 11 winners receiving £10 plus one overall winner of £110. The competition will be open to all 9 schools and the community within this parish.There will be 4 categories and entrants should pick one category only. Each category will have 3 age groups. (5-11) (12-16) (16plus) each category will have 1 winner from each age group. The deadline for entrants will be Saturday 27th September. For schools arrangements will be made with each individual school for their submissions of work. St Giles church hall, Hawes Lane, B65 9AL on Saturday 27th September at 2pm. The name/address or school/age and category should be on the reverse of the art work. Artwork should be no larger than A3, sculptures no heavier than 20kg (44lb) please. By sending us your art work, you agree to your art work being displayed if chosen in the art exhibition and that we may photograph your work to use to publish a 2015 calendar. No further payment will be made other than the prize money. Anyone from the immediate surrounding areas of Blackheath and Rowley who have family ties living in Blackheath or Rowley may apply for the competition. Details will be published on the web site of the winners and when art work may be collected following the exhibition. We hope we can get a snapshot view of Rowley in a period of time and bring the community together to highlight the talent we have in our area.